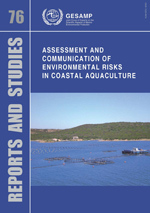 GESAMP - Assessment and communication of environmental risks in coastal aquaculture. Key words: coastal aquaculture, environmental risk, assessment, communication, risk analysis, GESAMP. This GESAMP study focuses on environmental risk assessment and communication in coastal aquaculture. To support effectively an open and transparent approach to sustainable resource use, risk assessment and communication must be able to fit within a broader social, economic and environmental decision-making framework. The communication aspects become paramount in enabling sustainable development in that type of decision-making environment. In today’s environmentally conscientious societies, no activity is truly sustainable without social licence. Scientific knowledge has to be developed, presented and communicated in a manner that fully acknowledges the extent and limits of our ability to predict the consequence of development. This applies at all scales, from development of a single aquaculture farm site to the development of a number of sites that may have a cumulative effect that cannot be predicted on the basis of the activities at a single site, and to the initiation of an entirely new industry. This publication presents a set of objectives, goals, methodologies and a checklist for assessment and communication of environmental risks which may be associated with coastal aquaculture. It is structured to improve risk communication and to ensure that risk assessment is a scientific exercise in predicting environmental change. Suggestions are given on how socio-economic values can be used with environmental risk assessment in open and transparent decision-making for questions of resource allocation. In addition, the risk assessment methodologies are designed to present a clear picture of the role of uncertainty in prediction error. This approach to risk assessment also helps target mitigation and research efforts to ensure knowledge of the causes and effects of environmental interactions of coastal aquaculture. A set of six case studies is also presented to illustrate the use of the environmental risk assessment methodologies in coastal aquaculture. These examples of environmental interactions span a range of cultured species from fin fish to molluscs and shrimp. The type of effects studied includes effects on carrying capacity, phytoplankton, kelp, benthic fauna, the genome of wild fishes and salinisation of soils. 3.1 What is risk analysis?